Water is very essential in the life of any living thing especially human beings. There are lots of reasons why we human beings shouldn't be neglecting water. Many people today prefer drinking more of liquids containing sugar, alcohol and fat which may also have adverse effects and cost more to them instead of just drinking water. The human body needs water so dearly in order for it function very well, a dehydrated is exposed to a lot of bad effects which can easily be prevented by just drinking a good amount of water daily. The earth is made up of 70% of water, so i don't think there's actually a tangible reason why you will choose not to be drinking more water because it's free and neither will it take you any stress to get it. Recently, health experts declared that people should be drinking at least 8 glasses of water daily which some people actually took serious while others may have taken it for granted. Well, the intention for this brief article is just to make you know why you should actually be drinking water more frequently for a healthy living. 1. Water is an energy booster. When the body has little or no water, it won't be able to carry out it normal activities. 2. Water serves as the body transport system, which means it enables the proper circulation of nutrients round the body. 3. Water helps to stop or reduce headache. Most at times, headache is basically caused by dehydration, so try to drink water next time your head hurts. 4. Water helps to prevent cancer. A recent research has declared that drinking a lot of water reduces one's risk of acquiring bladder cancer & colon cancer. 5. Water boosts the immune system. It helps to make your immune system stronger in order to combat diseases from the body. 6. Water increases the amount of red blood cells in the body enabling it to improve its lung function. 7. Water helps to break down food materials in the body in order for the nutrients trapped in the food to be released for the body use. 8. 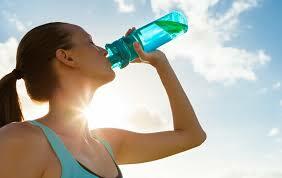 Water helps to hydrate the cartilages in order to prevent joint pains. 9. Water helps to maintain the body weight by regulating appetite and also increasing metabolism rate. 10. Water helps to flush out waste products and bacteria from the body so as to keep the body out from diseases. 11. Water helps to improve the texture and color of the skin by helping it rebuild new cells. 12. Water helps to regulate the body temperature. 13. Water helps to balance the mood by reducing stress and depression. 14. Water enables a proper sleep, when you find it difficult sleeping, trying drinking a glass of water.